Description: Phacelia calthifolia is an annual plant with bristly stems. The flowers are bell-shaped, about 1 cm diameter. Leaf: The leaves are dark green, rounded to heart-shaped with a notched base, 1-3 cm long and wide, with an entire or serrated margin. 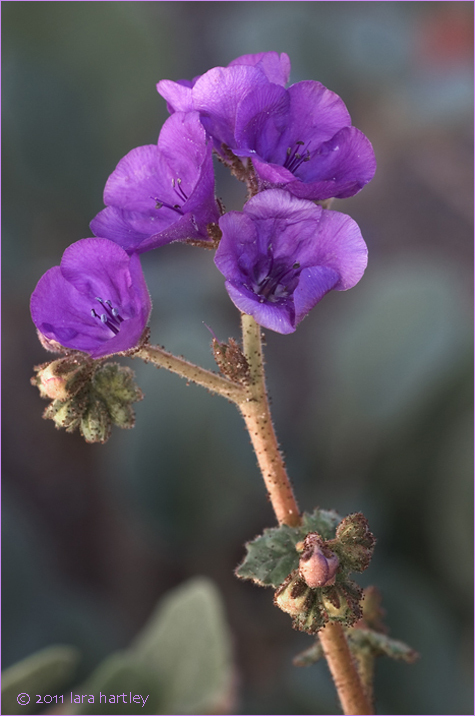 Notes: Phacelia calthifolia is a dicot that is native to California and is also found outside of California, but is confined to western North America. It can cause dermatitis. Distribution outside California: w Nevada. This photo was taken on February 12, 2005 in Death Valley National Park, Inyo County, California.